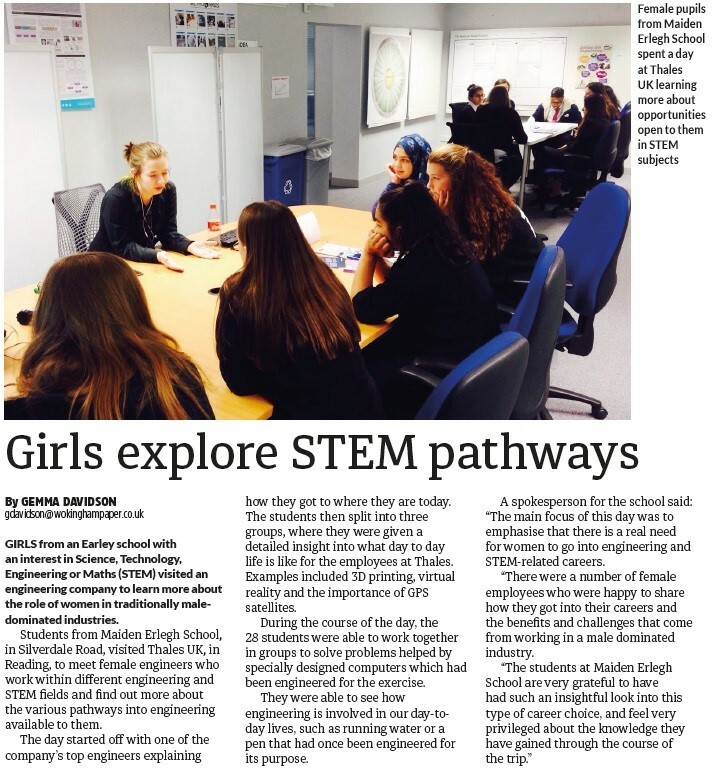 On 11 October 2016, 28 female students from Maiden Erlegh School with an interest in Science, Technology, Engineering or Mathematics (STEM) travelled to Thales UK; an engineering company, in order to learn and understand more about women in engineering and STEM-related roles. Thales offers a range of different branches into engineering including Aerospace, Transport, Defence and Security. 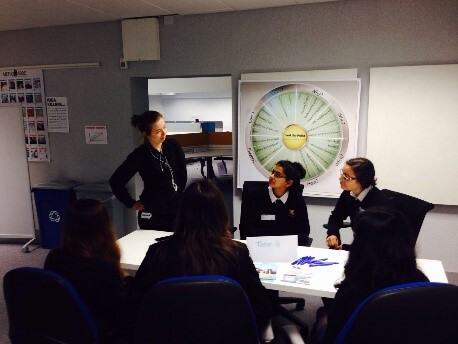 Thales opened the students’ eyes to help them realise that there are lots of pathways into engineering. The aim of the event was to give young women an opportunity to meet female engineers who work within different engineering and STEM fields. The event also provided an understanding of the variety of roles that are available and the different routes open to students to help them get there. 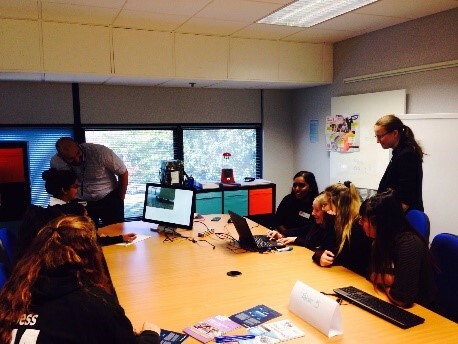 Students were given the opportunity to see the Thales site in Reading and the engineering/STEM environment. They greatly benefited from being part of an environment where they met interesting and inspiring women in the world of work. The day started off with one of the company’s top engineers introducing themselves and explaining how they got to where they are today. 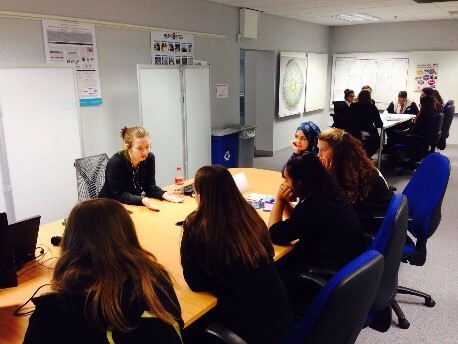 Next, students got split into three groups, where they got a detailed insight into what day to day life is like for the employees at Thales. Examples included 3D printing, virtual reality and the importance of GPS satellites. During the course of the day, students were able to work together in groups to solve problems helped by specially designed computers which had been engineered for their purpose. Students were able to see how engineering is involved in our day to day lives; something as simple as running water or a pen that had once been engineered for its purpose. The main focus of this day was to emphasise that there is a real need for women to go into engineering and STEM-related careers. There were a number of female employees who were happy to share how they got into their careers and the benefits and challenges that come from working in a male dominated industry. Thales UK offers a wide range of different career pathways into the company such as internships and apprenticeships – a way of earning money whilst learning the job, which is becoming an increasingly popular option for students. This helped students to realise that there are many STEM related opportunities available to them. The students at Maiden Erlegh School are very grateful to have had such an insightful look into this type of career choice, and feel very privileged about the knowledge they have gained through the course of the trip. Click here to discover more about the STEM activities provided by Thales.